Akin to how our grandparents’ generation is known for their thrift and frugality from living through the Great Depression, our generation may very well be known for a similar sort of risk-aversion…a changed generation of humility and financial conservatism, after seeing the worst financial conditions and stock market deterioration in our lifetime (note: in our lifetime). While I think much of the current panic and fear has been stoked by the media and politicians (what better way to keep eyes glued to the set and pray for our fearless leaders to save us with spending bills than to invoke fear and panic and claims of “the worst crisis since the Great Depression” when there are actually several periods in between with higher unemployment and greater GDP decay and something we haven’t seen yet – inflation), there are a lot of people now that have seen the chaos, lost a lifetime of savings to market risk that they probably shouldn’t have been exposed to, and perhaps will never own stocks to the degree they once did. Market Risk: Why were the Risk-Averse so Heavily Invested in Stocks? Inevitably, one has to ask why so many workers near or even past retirement were so beholden to stock market risk. There were many old assumptions about what sort of exposure people should have based on their risk tolerance and time horizon. Old-timers still espouse the view that you should have a mix of stocks and bonds with stocks comprising 100% minus your age and the remainder in bonds. Unfortunately, for a 55 year old approaching retirement, even having 45% in stocks resulted in a loss of 50% on that share and the bond piece fell apart as well if they were in anything besides Treasuries (which makes now an optimal time to Short Treasuries perhaps given their runup of late). With a nest egg of $1 Million, this “by the book” portfolio may now be worth south of $650,000. In the low interest rate environment we’re in now, trying to draw interest on that $650,000 to live on is a heck of a lot tougher than $1Million without depleting your nest egg in the next few years (rule of thumb is to assume 4% on your nest egg to cover annual expenses without depleting your principal…but who knows if that’s too aggressive now too?). Financial Advisors – Many Financial Advisors had their elderly clients invested heavily in equities. I personally know of people in their 60s and even one in their late 80s that are with “brokers” doing active trading for them with a 100% equities portfolio. Now, this criticism could be oversimplified. Other considerations are what other sources of income you have like guaranteed pensions, social security, etc., and if these other sources are adequate to cover your retirement needs, then yes, there is a place for some equities exposure even post retirement. However, we probably all know someone personally or through 1 degree of freedom, that has had to actually postpone their retirement or make major adjustments to their lifestyle, housing, or retirement plans as a result of the recent market downturn. It would be disingenuous to look back and say, “All Financial Advisors should have seen this coming and had their clients pull their funds out of equities last year”. Hindsight’s 20/20. One does have to question the prudence of some of the aggressive portfolios though, for people who don’t have the time to try and recover their 2007 levels of savings. Thousands, perhaps millions, of Americans will not live long enough to see their nest egg back at 2007 levels again. Keeping up with Inflation – Depending on how you measure inflation, it’s either been rather tame the past decade or two; or it’s been hellish. If you buy a lot of tech gadgets and clothes, inflation’s been great. If you’re spending disposable income on health-related expenses and trying to put a kid through college, inflation’s rather arduous. According to Moody’s chief economist at Economy.com Mark Zandi, data show that over the past 10 years, education costs have risen 5.91% per year, and health-care expenses have risen 4.16% per year, while wages and income have risen only 3.7% during that time. Imagine trying to keep up with close to 6% inflationary increases in college costs on “risk-free assets”. You can’t do it. In order to keep up with inflation, you’ve got to take on some risk/volatility, right? This is going to be a continual struggle for people since nobody’s predicting a slowdown in inflation in these sectors and you can’t even find a 4% CD any more at today’s best CD rates. Lack of Alternatives – For most Americans, many alternative investments like hedge funds, structured notes and direct real estate rental income was out of their reach. So, what alternatives existed for them? Assuming market risk. For the most part, people would seek out a financial advisor to try and manage their money for them or just leave it parked on autopilot in their 401K/403B/IRA accounts since that’s what they’ve always done…and it had always worked – and stocks were always part of that equation. “Stocks Always Bounce Back…And Return 9% over the Long Term” – This is what the history books tell us, as well as Peter Lynch and Warren Buffet. And for generations of investors, the buy and hold mantra had held true. By holding stocks and reinvesting dividends over long periods of time, patient investors were rewarded well. What people didn’t plan for was the Black Swan event that nobody thought could happen in today’s market. Am I diversified? Will my investments move in lock-step downward? Am I hedged at all? What is my time horizon? When will I need these funds and can I sustain a period of 10 or so years in order to allow for a partial or full recovery? What is my risk tolerance? Can I sustain a 75% loss in this particular account and still live survive with just minor adjustments? Should I be assuming market risk? Is it even worth it/necessary? What other sources of GUARANTEED income do I have? 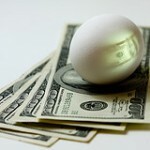 Are there pensions, Social Security, other accounts with Treasuries/FDIC insured CDs and Cash? In order to lessen the path of resistance to a 99% assured comfortable retirement, living a frugal lifestyle coupled with a disciplined approach to saving/investing over the long term is an easy answer. However, such a small enclave of Americans live such a lifestyle that this path to prosperity becomes a bit more complex for the vast majority of us. What Are Your Thoughts on How You’ll Prevent the Next 2008 and What are Your Preventative Actions?